First we had lunch at Mill Street Crepe Company, and that was delicious. Then later that night it was time for dinner - and we made our way to Cafe Postino. 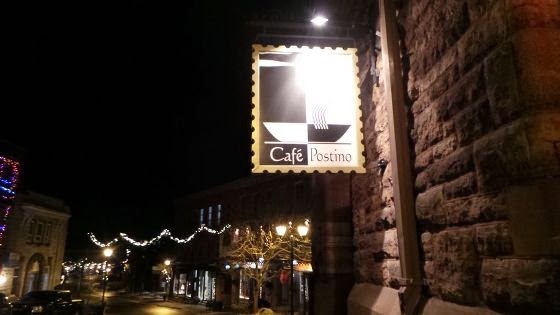 Cafe Postino opened in 2011 and have devoted clientele of locals, tourists and business people that continue to visit Cafe Postino on account of it's authentic, Italian cuisine. Italian is by far, my favourite cuisine and I knew Michelle was a fan as well - so I was VERY excited to try Cafe Postino in Almonte, ON. 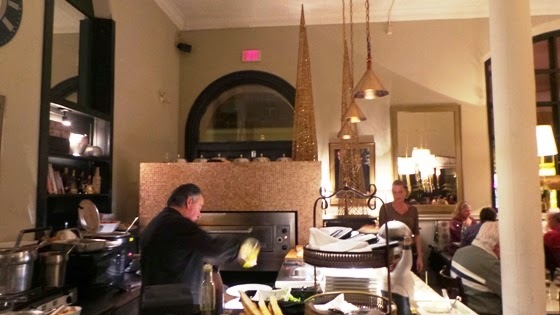 Not only is the food amazing at Cafe Postino, the ambiance and people are too. Chef, and owner Steve along with his wife Claire are like those Italian grandparents you see in the movies that welcome you with nothing but hugs and smiles! "Steve draws upon family recipes from his roots in southern Italy using the most flavourful and freshest of ingredients to create preservative-free homemade dishes. 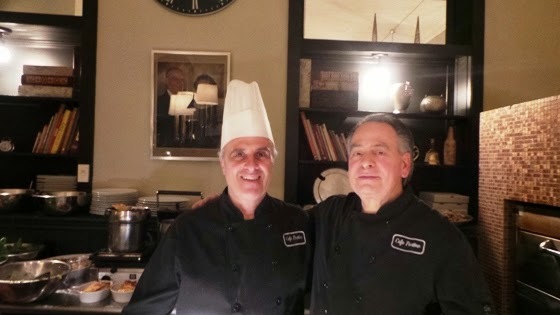 He takes pride in the traditional pastas, sauces and custom desserts that are made at the café. The wine list is carefully chosen by Steve to complement the meals, including the daily specials offered at both lunch and dinner." 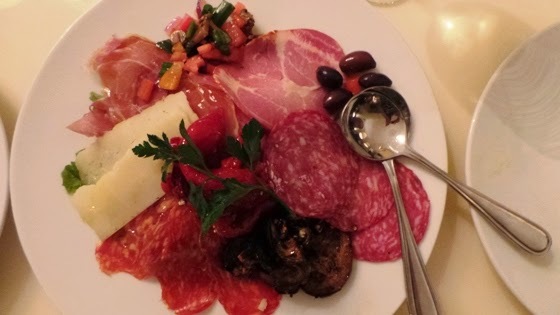 After ordering a bottle of wine, we decided to start our meal off with an order of Italian Antipasto Di Affettati. A plate of Genova salami, capicollo, prosciutto and provolone cheese with marinated eggplant and black olives. Shortly after, Claire brought over a pizza for Michelle and I to share. We hadn't ordered it - but she insisted we try it! 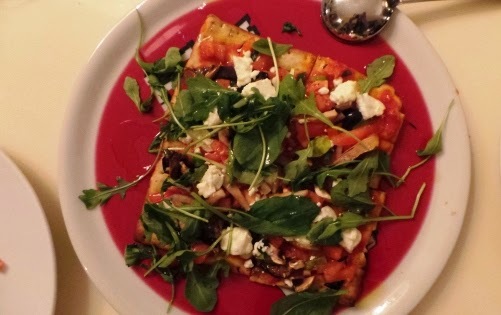 Piled high with fresh vegetables and crumbled goat cheese - this was a special pizza not on their every day menu. I love thin crust pizzas - and this one was delicious! When we were placing our entree orders, I asked Claire what her favourite dish was. She couldn't narrow it down to just one - so I asked what the most popular dish was. This was the Veal Postino. Scaloppine delicately dipped in flour and sauteed with butter, mushrooms, and green onion with a demi-glaze, creamy Sambucca sauce. This sauce is a specialty created in house and the dish was served with a side of pasta aglio e oilo, which is lightly spiced and topped with shaved parmesean cheese. That Sambucca sauce is like nothing I have ever tasted before! It was creamy and just, perfect. I'm not a fan of Sambucca shots (blame my days as a bartender when I did one too many) - but this had the taste of Sambucca, without the alcoholic burn. Michelle opted for a dish that was the pasta special of the night - cheese and truffle stuffed ravioli in a tomato sauce. 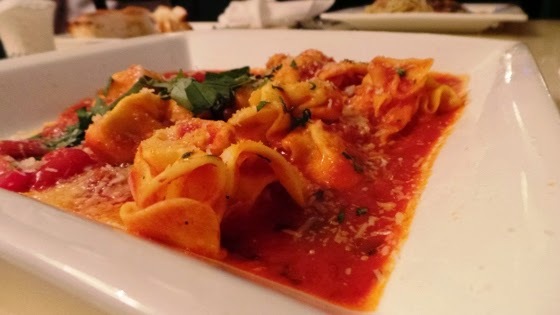 The pasta was so fresh and made in-house, stuffed with the perfect amount of cheese and truffles. I only tried one bite (because I was too busy stuffing my face with my delicious dinner) but Michelle insisted the pasta was delicious! In fact, this was what she said, word for word: "I'd rate it a 10 out of 10 and I'm Italian!" 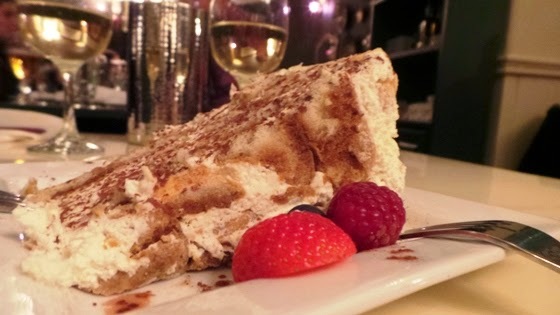 We decided to end the night on a sweet note with a shared tiramisu. Again, another creation in-house the tiramisu was Lady Finger's dipped in espresso, layered with mascarpone cheese and lightly flavoured with a liquer. 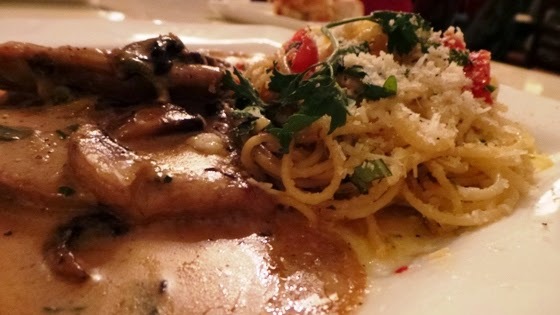 Dinner at Cafe Postino blew our expectations out of the water. As I mentioned, I'm so lucky that I get to try all of these different restaurants. Michelle's initial thought was "You wouldn't expect such great quality food, from a small town restaurant like this!" 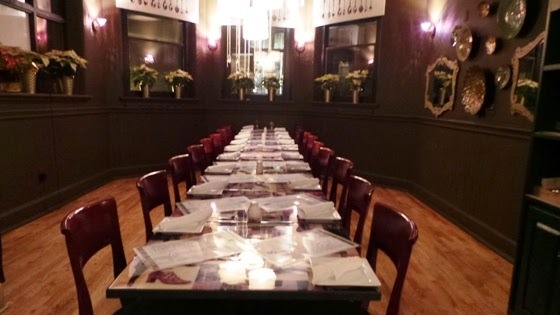 The food, the service, the ambiance - everything was just perfect. A great experience overall. Disclaimer: Dinner was complimentary as part of my Press Trip in Lanark County, however - as per usual the view are entirely my own (and Michelle's ion this case) and I really do want to figure out how to reproduce the Sambucca sauce and/or go back for more!